Amazon has opened its latest grocery initiative, which takes a direct hit at the “click and collect” pickup services that more and more supermarket retailers are offering. Here’s how the new service works: Shoppers order online from AmazonFresh’s selection, which features “thousands of grocery items available at low prices — including high-quality meats, fresh produce, bread, dairy, household essentials and more,” according to the company’s website. After ordering, they reserve a pick-up time (starting at 15 minutes after the order is placed) and drive to the selected Pickup location. 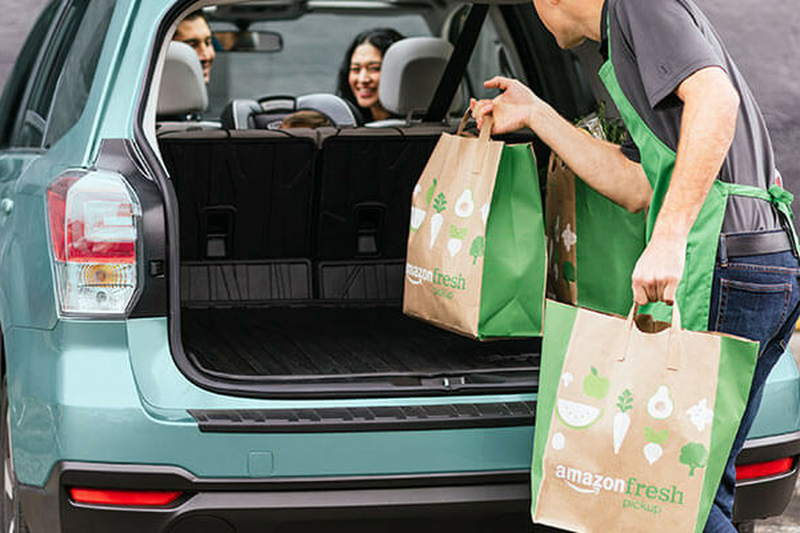 Shoppers pull into a parking space, and Amazon employees load the groceries directly into the customers’ cars. The service is free and exclusive to Amazon Prime members, unlike the company’s AmazonFresh delivery service, which costs $14.99 per month. There is no minimum order.